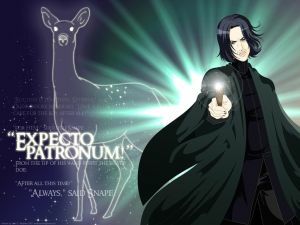 Sorting Hat | Expecto Patronum! Note (added 8/29/2011): This post was written 8/15/2011, the day the Pottermore Beta Test opened… and before I gained access. I have since written about my own first impressions of Pottermore. UPDATE: We now have an eyewitness account from inside Pottermore! See the Comments thread for details! Warning: The Comments Contain Mild Spoilers! Also… if you have been inside Pottermore and would like to share your experience, feel free to add your comments to the Comments thread below. We’d love to hear what you have to say! I was taking a Math exam when the “Sign In” button reappeared, so I’m a bit late reporting it. BUT… Pottermore Beta testing has begun. I have not yet received my Welcome email. According to the Pottermore Insider they will be letting in a “very small number of people onto the website” at first. But they will continue to be activating accounts for the next few weeks. 1. Can you move back and forth through the chapters? 2. Do you get your wand and go through sorting first? Or do you have to wait for the Diagon Alley and Sorting Hat chapters before you can get your wand and get sorted? 3. What does it look like inside? Can you contact other members? Can you see other members? We’re all curious… so please let us know. Note: Don’t read the Comments if you don’t want spoilers! I’ll also be checking forums where people I know have access, and will report back on what I can. Well, I’m back. It may take me a post or two to get into my groove. But YAY! We’re finally at Hogwarts! Sooooooo. The castle doors have swung open, and Professor McGonnagall has taken the first years in hand – leading them into a small chamber off the Great Hall, where they sweat out what sort of “test” will sort them into their Houses. Ron thinks it will hurt. Harry worries about his lack of knowledge. Hermione (so nervous that showing off is her only recourse) whispers wildly all the spells she learned since she got her letter. And then the ghosts float through the walls! What’s wonderful about this vignette is that even the holding area develops the characters while painting a portrait of the school. Professor McGonnagall – tall, black-haired, and dressed in the same emerald green she wore when camped outside the Dursleys 10 years before – seems eternally stern and no-nonsense. Our future Gryff Trio seem all different kinds of train wreck. But the ghosts… oh the ghosts! Oblivious at first to the living, the ghosts come through the walls arguing about “Peeves” – and frighten the already-terrified ickle firsties. Currently offstage (though not for long! ), the poltergeist will become a recurring antagonist – and occasional ally – throughout the series. 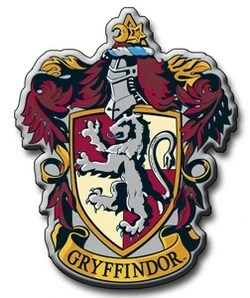 Gryffindors – full of daring, nerve, and chivalry, brave at heart. Hufflepuffs – hard workers, just, loyal, and true. 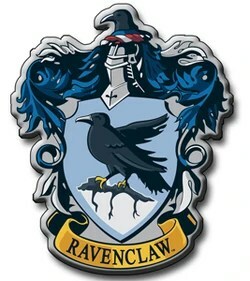 Ravenclaws – ready minded, full of wit and learning. 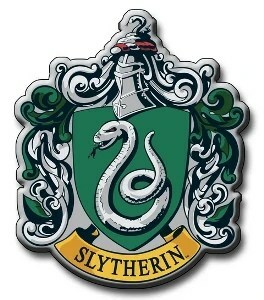 Slytherin – full of cunning, using any means to achieve their ends. Everything we’ve heard up until now tells us that Slytherin is bad. Hagrid first told Harry that every Wizard gone bad had hailed from Slytherin, and Harry’s first encounters with Draco and his crew convince him that it’s the last place at Hogwarts that he wants to be. The Sorting Hat, though, is not so sure. Harry’s perception of Slytherin will have a huge impact on the story. When the Hat announces Hogwarts’ first new Slytherin, Harry notes that “they looked like an unpleasant sort” (the side comment, however, indicates that his imagination could be filtering that perception through everything he’s already heard about the House). Regardless, when Harry (“The Harry Potter?”) finally steps up to the Sorting Hat, he begs “Not Slytherin.” And though it lingers in its decision, the Hat finally announces him the newest “GRYFFINDOR!” Harry, Ron, and that annoying Granger girl – Team Gryff – all get sorted out… into (where else?) the same House. So where do we go from here? To what I’ve just been dying to write about! The Great Feast, where we will finally see Professor Dumbledore in his element, and get our first sighting of the Head of Slytherin House – Professor Severus Snape.